Some few examples of a larger effort to document repainted brands on pick-up trucks. 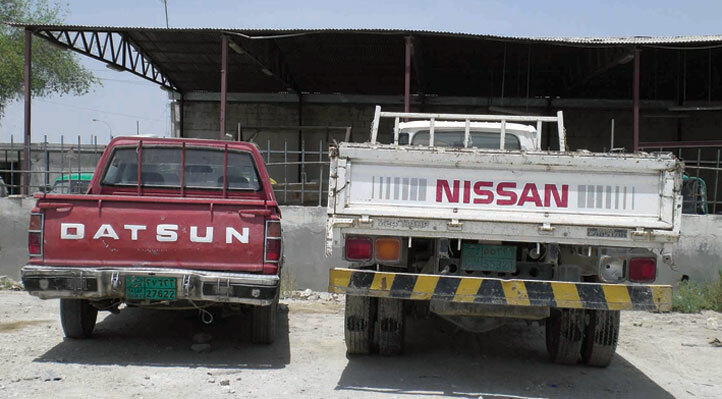 Many workers in Doha take great pride in these old and often re-purposed vehicles, preserving even “dead” brands like the ubiquitous Datsun, seen above with its heir, Nissan. Both are hand-painted. I hope to have larger description finished soon, and there are a few more images available here. This entry was posted by Erik Brandt on Saturday, January 12th, 2008 at 7:15 PM	and is filed under Aktuell, Education, Geotypografika, Globalization, Graphic Design, International, Internet, News Links, Typografika, Typography.